Last weekend was perfect motorcycling weather! A few of us went for a little jaunt and it felt great to get some fresh air. Crossed Hammer Choke Knob Brackets are back in stock and ready to ship. 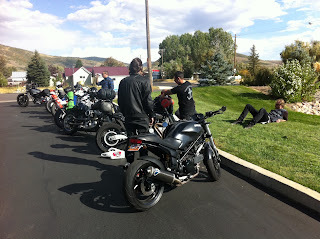 This weekend some friends and I rode up the wasatch mtns. And camp. I started the trip off right by gettin rear ended while getting off the freeway. It was a really nice ride up until we hit a gnarly rain storm but that only lasted a few min. After the two navy seals created a clothes line we made hot dogs and hung out the rest of the night. In the am we tore through the canyon back to regular life. All in all it was a really fun time.